Don’t leave the docks without one. Don’t go home without one! I SWEAR IT’S HERE SOMEWHERE, SIR! As a former attorney, I’ve actually seen attorneys and clients attempt to use the lame excuse. It was met with the expected level of enthusiasm and never garnered any sympathy. 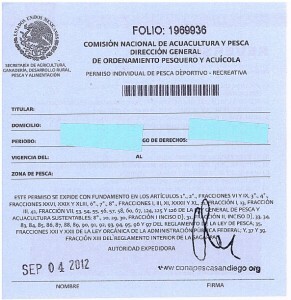 However, here in Mexico, when fishing licenses are checked, I’ve seen it work to some degree. It all depends on the sincerity of the offender and the benevolence of the inspecting officer. Stuff happens. They officers understand. You accidentally leave it in the hotel room; you get in too late to purchase one; it’s in your “other pants.” The charter operator charged you for one, but fraudulently or negligently, never gave you the actual paper (most often fraudulently). The inspectors have heard it all. It’s going to get a bit tougher to “slide by” in the future. Mexico recently announced that it’s going to strengthen it’s presence on the waters and cracking down on fishing and boating permits. And there’s really little cause to gripe. We’re visitors. The law is the law. You’re supposed to have a fishing license if you’re on a fishing boat. If you’re bringing your boat into Mexican waters, you’re supposed to have your paperwork in order as well. We expect the same in the U.S. Have your paperwork in order or there are penalties and consequences. Simple. Sure, folks get away with it, but do you really want to be the one who gets caught? And what fun is it looking over your shoulder anyway when you’re supposed to be having fun? Penalties can vary. They can turn your boat around and send you back to the beach (or back into U.S. waters). There can be fines. I once saw an independent panga captain who didn’t have his paperwork and neither did his clients get sent back to the beach. The inspectors confiscated the panga. They confiscated all the fishing gear and the fish. The clients were stuck sitting on the beach trying to find a ride back to town. That was pretty extreme. But… Don’t let that be you. The problem in the past, many times, is that most folks want to comply. However, there was so much confusion on how and where to do it. There were several Mexican government websites that sold them, but the service was terrible. The site would crash. It would take money, but not print out the permits. It would get the dates wrong. It was disastrous. Tackle stores sold them in S. California and in Mexico. But, not all of them carried them. There were several reliable American websites that sold them. Often, a charter operation would sell them. Or, in a worst case, charge clients for them; pocket the money and the clients would never receive a piece of paper. According to the latest releases, the authorities will be more vigilant. The purpose is to make sure that sport-caught fish are caught legally. (There’s a lot of poaching out there). Make sure you have that piece of paper on your person when you go fishing. Either get it online; from an authorized vendor or from your charter operation. Make sure that the name on your license matches your passport or other photo i.d. By the same token, after you’re done fishing, don’t throw that license away. When you bring fish home, airport inspectors are now sometime checking that the fish you’re bringing home were caught legally as well. Showing them your fishing license will validate it. If you do get stopped, be respectful. Same as you would with any officer. Yelling or having attitude won’t get you any points. They’re just doing their job and it’s a low-paying thankless job. The inspectors are not picking on you. They’re out checking permits on local boats as well. Most of the inspectors I’ve run into or had conversations with are in-turn very respectful as well. Most will wish you a good day and send you off with a smile and a wave. Offering a bottle of cold water or soda is welcome too. These have been the laws for a long time. Just now it’s going to be more strictly enforced. Don’t be surprised or let it ruin a vacation. Comply with the regulations and you’ll be fine. Don’t be caught looking over your shoulder!